When confronted by police who saw her standing in the middle of a street an 18-year-old woman assaulted two officers. 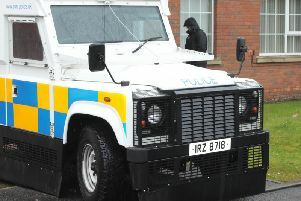 Claire Hughes, Park Road, Portadown, was fined £100 last Wednesday at Craigavon Magistrates Court for disorderly behaviour on July 7 this year. She was also fined £150 on each of two charges of assault on the police. The court heard that at 5.45am at Park Road Hughes was found standing in the middle of the road with her arms raised. When police were about to detain her under the mental health act she started shouting and swearing. Hughes then hit an officer in the face, grabbed his arm with her nails causing grazing and kicked another on the legs.